Make it four straight months of record-high readings for the Manheim Used Vehicle Value Index. In August, wholesale vehicle prices — adjusted for mix, mileage and seasonality — were up 0.75 percent from July, according to the latest report on the index compiled by Cox Automotive chief economist Jonathan Smoke. The resulting measure of Manheim’s index was 131.3, a 3.4-percent year-over-year increase and, once again, the highest ever reading for this index. While Cox Automotive estimates that the seasonally adjusted annualized rate for used-car retail sales in August (38.1 million) was down from July (40.1 million), used-car sales have actually climbed 1.2 percent so far this year. That includes what was best second quarter ever for the used-car market and the first time there was more than 10 million used-car sales in Q2, according to Edmunds. Overall, there were 10.05 million used-vehicle retail sales in the second quarter, Edmunds said. That’s a 1.7-percent year-over-year uptick and up 7.9 percent from five years ago. What’s also up significantly are used-car transaction prices on the retail side. Edmunds said that consumers paid an average of $19,227 for a used vehicle in the second quarter, the highest ever for Q2. And it’s the older vehicles where the wallet wallop is happening. Edmunds noted that vehicles 6 years and older have improved their retention, which is driving this surge. For instance, the retention of original MSRP on a 10-year-car in 2012 was 21.1 percent, on average. It was at 26.4 percent in the second quarter, Edmunds said. A 10-year-old midsize SUV had 16 percent retention in 2012; it’s now 32.5 percent. “Vehicle sales reached historic lows during the recession, and now fewer consumers have an older trade-in when they buy a new vehicle,” said Ivan Drury, Edmunds senior manager of industry analysis, in a news release. “It’s the basic law of supply and demand. People still want to buy affordable older cars, but there simply aren't as many out there,” he said. Conversely, deprecation has escalated among later-model vehicles. Retention on 1-year-old used vehicles has slid from 76.6 percent in Q2 2012 to 70.9 percent in the second quarter of this year, Edmunds said, with the impact being felt the most in car segments. This late-model decline largely has been driven by heavy off-lease supply and incentive hikes. And, Drury said, an uptick in leasing. “The surge in popularity of leasing has led to a more disposable mentality about personal vehicles, which has taken a toll on the values of newer used cars,” he said. The difference in price on a 1- and 10-year-old car has gone from 55.5 percent to 44.4 percent over the past five years, meaning a less affordable used-car market overall, Edmunds said. But again, the company emphasizes that retail sales are still strong. In fact, shifting back to the Cox Automotive analysis, analysts are expecting a 3-percent lift in full-year used-car sales thanks in part to demand for replacement vehicles in southeast Texas following Hurricane Harvey. “The dynamics of the used market are completely different now than they were five years ago, and we don't see this trend reversing anytime soon,” said Drury, the Edmunds analyst. Fueled in part by its used-vehicle performance, Lithia Motors posted its 27th consecutive quarter of record results, including the highest second quarter revenue and earnings per share in company history. Helping Lithia to those achievements were used-vehicle retail same-store sales increasing by 4 percent. All told, the dealer group retailed a total of 32,171 used vehicles, up from 27,716 units in Q2 of last year. While Lithia moved much more used metal, its average gross profit per unit on those used-vehicle deliveries softened by $109 year-over-year as the Q2 figure settled at $2,316. Also providing support to Lithia’s overall performance was how the dealer group’s F&I gross profit per unit nearly reached $1,300. A $27 lift from last year’s second quarter left the metric at $1,298. The company’s Q2 net income per diluted share increased 5 percent to $2.12 from $2.01 in the year-ago span. Adjusted net income per diluted share increased 16 percent to $2.28 from $1.96 for the same period in 2016. Second quarter net income increased 3 percent year-over-year to $53.2 million from $51.4 million. Adjusted net income rose 14 percent to $57.2 million, up from $50.2 million. Lithia pointed out that the Q2 adjusted results exclude $0.16 per share in non-core charges related to acquisition expenses and a hail storm insurance reserve. The 2016 Q2 non-core adjustments exclude a $0.05 benefit associated with an equity investment. The dealer group added that Q2 revenue increased 16 percent to $2.5 billion from $2.1 billion. At the halfway point of the year, Lithia highlighted its revenues have increased 14 percent to $4.7 billion. Net income for the first six months of the year came in at $4.13 per diluted share, compared to $3.56 per diluted share for the similar period in 2016. “We continue to execute our strategy of acquiring strong franchises that underperform their potential and improving earnings as they season,” Lithia president and chief executive officer Bryan DeBoer said when the company released its results on Friday. “We increased quarterly revenues 16 percent and adjusted earnings 14 percent over last year, driven by our significant acquisition cadence. “On a same-store basis, we grew new-vehicle sales slightly, increased used-vehicle sales over 4 percent, and grew service and parts over 7 percent,” DeBoer continued. “We recently raised $300 million in senior notes and anticipate deploying the capital for acquisition growth in the future. “As we integrate acquisitions and seek to improve their earnings, we increase future cash flow and produce greenfield-like returns,” he went on to say. As Asbury Automotive Group chose to leave its standalone used-car store business, Sonic Automotive’s dedicated used-vehicle rooftops are adding so much to its performance that the company is expanding the segment. Sonic highlighted on Friday that it retailed a record number of used vehicles during the second quarter, turning 30,536 units that contributed $40.0 million in gross profit. Of that Q2 figure, Sonic’s standalone used stores — EchoPark — retailed 2,049 units, up 80.4 percent over the prior year quarter. As a result, Sonic announced that it is accelerating an expansion of an additional 15 EchoPark stores by the end of 2018. “Given our performance at EchoPark, we are accelerating our expansion into the Carolinas, Florida, Georgia and Texas markets. Our Colorado stores were cash flow positive in the quarter. Currently, we have more than 15 locations in the aforementioned markets that will break ground in 2017 and 2018,” Sonic executive vice president of operations Jeff Dyke said in a news release. On the new-car side, Sonic retailed 32,466 units during the second quarter, down from 33,229 units a year earlier. “The new-vehicle retail sales environment continues to be challenging in Houston and across certain brands,” Dyke said. “Our exposure to BMW, coupled with economic conditions in Houston's energy corridor, pressured sales and profitability in the second quarter. Dyke then turned back to where Sonic thrived during the second quarter. “Other parts of the business, however, continue to experience growth. We were able to grow used vehicle, fixed operations and F&I (finance and insurance) gross profit during the quarter, which is a testament to the dealer operating model,” Dyke said. Sonic also reported that net income from continuing operations for the second quarter came in at $12.3 million, or $0.27 per diluted share. These results include charges related to fixed asset impairments, weather-related physical damage costs, legal matters, and charges associated with closing and relocating stores. “Our activities in the quarter continue to support our long-term growth strategies,” Sonic chief executive officer Scott Smith said. “During the second quarter, we opened our new open point Audi store in Pensacola, Fla., and our sixth EchoPark store in Colorado. We believe these investments will offer strong earning streams as the underlying businesses mature. “Year to date, we also invested approximately $30 million returning capital to stockholders through dividends and share repurchases,” Smith continued. “Our facilities teams have been extremely busy as well, evidenced by the $121 million invested in capital expenditures during the first half of 2017. “We are committed to offering the best customer buying experience in the industry, which includes state-of-the-art facilities at both our franchised dealerships and EchoPark stores,” he went on to say. Paced by a 25.1 percent jump in used-vehicle retail sales, Penske Automotive Group reported on Thursday that the company posted the highest quarterly income from continuing operations and earnings per share in company history during the second quarter. Penske highlighted Q2 income from continuing operations attributable to common shareholders increased 11.9 percent to $106.0 million, and related earnings per share increased 10.8 percent to $1.23 when compared to the same period last year. Through its international operations, Penske indicated that it retailed 66,208 units during the second quarter, up from 52,936 units a year earlier. While the company turned many more used vehicles, Penske acknowledged its gross profit per unit softened to $1,416, off from $1,697 in the second quarter of last year. Meanwhile, Penske also improved its F&I gross profit per unit performance as the Q2 figure came in at $1,131, representing a rise of $39 year-over-year. “I am pleased to report another quarter of record results, highlighting the diversity of our transportation services business model, driven by the solid performance of our U.S. and U.K. automotive markets, contribution from our used car super centers, and the benefit from the investment in Penske Truck Leasing,” Penske Automotive Group chairman Roger Penske said. As a result, Penske’s board of directors approved an increase in the cash dividend to $0.32 per share for the second quarter. Commenting on the dividend, Penske Automotive Group president Robert Kurnick Jr., said, "For the 25th consecutive quarter, the board of directors is pleased to offer an increase in the quarterly dividend for PAG's shareholders. This increase continues to demonstrate the confidence we have in our diversified business model." The dividend is payable on Sept. 1 to shareholders of record on Aug. 10. Group 1 Automotive established a new record gross profit per unit through its F&I department during the second quarter. But softened used- and new-vehicle sales in areas where the bulk of its dealerships are located — Texas and Oklahoma — left a significant impact on the dealer group’s top-line performance. According to its latest financial statement released on Thursday, on a same-store basis, the company’s U.S. revenues came in at $2.1 billion in Q2, a year-over-year decrease of 2.7 percent. Total same-store gross profit was essentially flat. Group 1 explained the revenue decrease reflects 5.7 percent and 4.9 percent declines in same-store retail new and used unit sales, respectively. Group 1 stores retailed a 25,202 used vehicles in Q2, down from 26,856 units during the same quarter a year earlier. The dealer group wholesaled 2.4 percent more vehicles in Q2, sending 9,701 units through those channels. That’s up from 9,476 units in the year-ago period. As mentioned, Group 1 stores generated a 5.4 percent or $86 increase in F&I gross profit per unit to post a new company record at $1,688. And while U.S. same-store parts and service revenue increased 5.6 percent, “these factors were not enough to offset ongoing weakness in vehicle sales in our energy-price-impacted markets. Combined new and used sales dropped 7 percent in the quarter for our Texas and Oklahoma stores,” said Earl Hesterberg, Group 1’s president and chief executive officer. In other company news, Group 1 also announced it has acquired its first Jaguar and Land Rover dealerships in the U.S., which are located in Albuquerque and Santa Fe, N.M. Management indicated the stores have projected annualized revenues of $40 million. The addition of these two stores expands the company's global network to seven Land Rover and seven Jaguar franchises. The dealerships, which operate as Jaguar Land Rover Albuquerque and Land Rover Santa Fe, are the only Jaguar and Land Rover dealerships in the state of New Mexico, and expand the company’s presence to 15 states in the U.S. The second-quarter dealer survey orchestrated by KeyBanc Capital Markets confirmed how used-vehicle and F&I performances are helping to pick up the slack dealerships might be experiencing within the new-car operations. 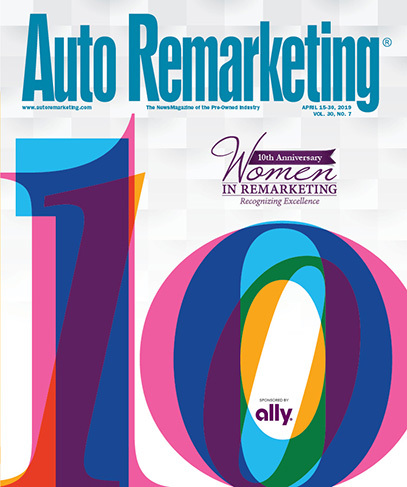 The report shared this week with Auto Remarketing indicated trends in F&I gross profit per unit maintained a favorable trend with 86 percent of respondents reporting intact results in June or even increasing figures by more than $50 year-over-year). For the full quarter, 90 percent of participating dealers noted flat or increasing gross per unit coming out of their F&I offices as 51 percent reported an increase and 39 percent reported flat results. The remaining 10 percent acknowledged a decline, according to KeyBanc’s report. Looking at the full second quarter, KeyBanc found that the trend wasn’t much different, with 37 percent reporting an increase, 29 percent reporting a decline, and 34 percent reporting unchanged gross per unit for used-vehicle turns. Meanwhile, the report pointed out that surveyed dealerships “faced renewed pressure” when it came to grosses on new-vehicle sales. A total of 86 percent of respondents reported a decline of more than $50 in July compared to this time last year. For the full second quarter, 60 percent of respondents reported weakness in the segment, KeyBanc said. “While we believe sales will pick up in the back half of the year, the risk appears to be to the downside,” KeyBanc added. Also of note, the report added that parts and service gross margins remained intact, according to survey results. A consistent majority of respondents — 71 percent in June and 72 percent for the full quarter — reported a 100 basis points or more increase in parts and service gross profit margin. Analysts closed the latest survey report by mentioning how trends spotted involving used- and new-vehicle sales is likely to continue since the amount of off-lease units available is high. “We believe as inventory of attractive, late-model low-mileage used vehicles continues to increase, we will continue to see some new car buyers shift into the late-model used vehicles,” they said. Dashboard Dealership Enterprises has redesigned its business analytic reporting suite for increased functionality using input from dealer clients. Executive Eye 3.0, the latest version of Dashboard’s flagship product, offers a variety of graphic display options designed to help dealers easily navigate the program. New visual enhancements include updated colorful themes, more white space and increased organization. "Reporting has always been clunky, time consuming; often it’s difficult for dealers to understand how numbers translate into actionable data," Dashboard Dealership Enterprises chief executive officer Josh Blick said in a news release. "Executive Eye 3.0 is a groundbreaking tool that completely changes the paradigm of how a business analytic reporting tool can be used. Instead of spending time compiling reports, managers instantly have actionable data at their fingertips." In beta testing, Executive Eye 3.0 exhibited a 30 percent increase in dealership usage compared to an average usage of 2.0, according to Dashboard. The suite’s direct messaging capabilities allow dealers to communicate directly with Dashboard's customer support and other users. The messaging tool’s reports, alerts and comments can all be shared without the need to compose emails outside of Executive Eye. Additionally, Executive Eye’s Consolidated Doc report allows dealers to instantly combine documents from individual stores into a single report. Dealers interested in performance comparison can also view key performance indicators from each of their stores side-by-side. Executive Eye 3.0 is mobile-friendly across all platforms and devices. A mobile application download is not needed to access the software on a mobile device. Carvana founder and chief executive officer Ernie Garcia is confident that the online used-vehicle retailer will have turned at least 10,000 units by the time the second quarter closes at the end of the month. And Garcia is upbeat that the gross profit per unit will be about $1,400. “The path to profitability is clear,” Garcia told investment analysts when Carvana hosted its first quarterly conference call as a publicly traded company on Tuesday. “The strength of the demand we are seeing with end markets and our ability to open new ones provides most of the fuel necessary to enable our total GPU (improvement). The brand we have built is powerful. Our website and brand assets like the vending machine make a strong impression and tell a clear story to our customers. “We are executing,” he continued. “We are a 4-year-old company and have achieved this scale in this timeframe because we are comprised of a group of people that believe in what we are doing and that pour themselves into delivering incredible customer experiences every single day. I couldn't be prouder to call myself a part of that group. We are well positioned. My view isn't that customers are just now becoming ready to buy cars online. My view is that customers have been ready for a while, but the right product hasn’t been available to them and that demand has remained waiting. “I believe this is because building an easy-to-use ecommerce platform that lives up to the expectations of customers is very hard and requires expertise in many different areas. If it is hard the first time, it will also be hard to replicate,” Garcia went on to say as a part of his opening comments. While Carvana posted record revenue in Q1, its net losses spiked, too. But later in the call, Garcia pointed out the strikes Carvana is making in gross profit per unit. Back in 2014, the company lost about $200 per unit on average. A year later, Carvana improved to about $200 in positive gross. Last year on average, Carvana said that gross profit rose to roughly $1,000. The math then isn’t too complicated. If Carvana turns 10,000 units and the gross averages out to be $1,400, that computes to $14 million. Garcia closed the call with a message directly to his employees. “To everyone on team Carvana out there, thank you for everything you’ve done to get us here. Achieving these goals relies on nothing more than us executing on our plan. Let's do it and let's have fun along the way,” he said. With the expectations of retailing 10,000 units in Q2 and perhaps 44,000 to 46,000 for the year, investment analysts wondered if Carvana’s inventory strategy put the company in place to hit those targets. Currently, Carvana holds about 7,500 units in inventory that’s spread throughout the 29 markets where it operates. “So the way I would think about that is I think we still believe that there are gains in conversion rates to be had by growing inventory from here,” Garcia said. “We believe that those gains are less pronounced than they were when our inventory was smaller. And so the balance of growing inventory and growing conversion versus recognizing higher gross margins by holding a smaller inventory turning cars faster has shifted to where we now have more of a focus on driving down average days to sale and driving up GPU. So you can expect to see that going forward. “We do expect also to be growing inventory over that timeframe,” he continued. “Over the next several years, we don’t expect it to be completely flat. And then in terms of where that could go, I think if you look at other retail models across the board, you see kind of 30 to 60 days is probably the average window of average days to sale that you see for other groups out there. “I think our medium term goal is to get in line with traditional retailers and I think from there, there is certainly upside,” Garcia added. Chief financial officer Mark Jenkins noted that approximately 70 percent of site buyers use Carvana financing to complete their purchase. Carvana made arrangements with several finance providers to help move metal, including Ally Financial and Randolph-Brooks Federal Credit Union (RBFCU). Online used-vehicle retailer Carvana highlighted that its first-quarter revenue soared to a new record, increasing by 118 percent year-over-year. Unfortunately, the record revenue figure of $159 million wasn’t enough to overcome the company’s expenses that resulted in Carvana sustaining a net loss of $38.4 million, representing an increase of 122 percent. Still, with improvements in the number of units retailed and gross profit per unit, Carvana leadership remains upbeat about its future as a publicly traded company that caters to online-savvy vehicle purchasers. “We are excited to announce record revenue in our first earnings report as a newly public company. Our strong performance this quarter reflects a significant increase in retail units, as well as expansion into new markets. During the quarter we made important enhancements to the customer experience through new product development, resulting in ongoing optimization from website through vehicle delivery,” Carvana founder and chief executive officer Ernie Garcia said when the company released its financial report late on Tuesday. “We continue to see increased consumer adoption of online car buying across our markets, charting a clear path to consistent growth within the $710 billion U.S. used auto market. Carvana’s unique business model includes proprietary technology and assets, like the vending machines, that deliver customer experiences that position us to execute against our aggressive growth plans,” Garcia continued. The company reported that it retailed 8,334 vehicles during the first quarter, an increase of 120 percent year-over-year. Carvana’s total gross profit per unit was $1,169, an increase of $123 per unit. And the company’s total gross profit for the quarter came in at $9.7 million, a spike of 146 percent. Still, Carvana’s net losses have gone from $17.3 million in the year-ago quarter to $35.7 million in the closing quarter of last year to above $38 million in Q1. And on Wednesday, Carvana announced the company added two more markets in Georgia, bringing aboard Augusta and Macon. Editor’s note: Watch for an upcoming report from Auto Remarketing featuring more comments from Carvana leadership about its Q1 performance and future expectations.